Beautiful Christmas Seal Subscription Certificate from the National Tuberculosis and Respiratory Disease Association printed in 1970. This historic document has an ornate border around it with vignettes of the Cross of Lorraine. This item has the printed signature of the Company’s Managing Director, Robert J. Anderson and is over 44 years old. The National Tuberculosis and Respiratory Disease Association name began use in 1968 and changed in 1973 to the American Lung Association. The American Lung Association, or ALA, is a non-profit organization that "fights lung disease in all its forms, with special emphasis on asthma, tobacco control and air quality." The organization was founded in 1904 to fight tuberculosis as the National Association for the Study and Prevention of Tuberculosis. Renamed the National Tuberculosis Association, or NTA, in 1918 and the National Tuberculosis and Respiratory Disease Association, or NTRDA, in 1968, it adopted its current name in 1973. Its most famous tagline was and remains, "It's a matter of life and breath." 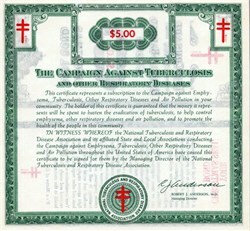 A modified version of the Cross of Lorraine serves as a logo for the Lung Association. The Paris, France, physician Dr. Gilbert Sersiron suggested its use in 1902 as a symbol for the "crusade" against tuberculosis. The ALA is funded by contributions from the public, along with gifts and grants from corporations, foundations and government agencies. 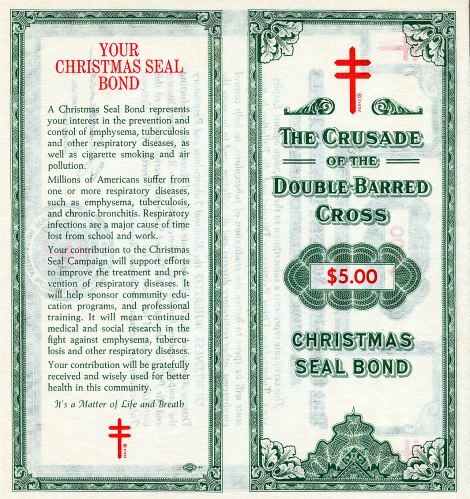 One of its best-known fund-raising drives is the Christmas Seals program, which has been an annual fundraising and public awareness tool for tuberculosis and lung disease since 1908.